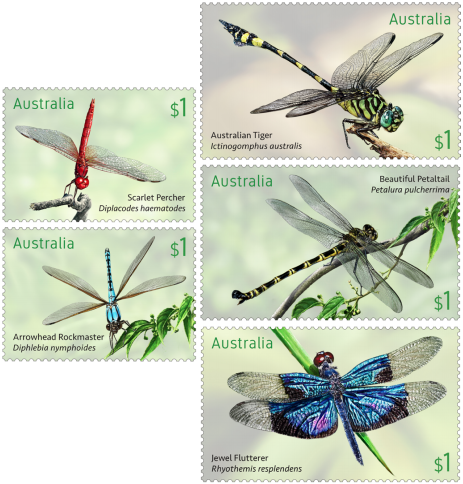 Australia Post has released some limited information on their Stamp Collecting Month (SCM) release, which this year will feature Dragonflies (the issue is called "Dragonflies: Nature's Flying Machines"). Interestingly the issue only features five stamps (compared to the usual six to eight), and it appears SCM has been brought forward to August, with the stamps released on 1 August 2017. The five stamps (two at 37.5 mm x 26 mm and three at 50 mm x 30 mm) will also be released in a miniature sheet. I suspect that the miniature sheet stamps will have foil applied to dragonfly wings as was done with the Small Pond issue in 1999. All in all a very attractive issue.